The word Fajita derives from the Spanish “faja” for “girdle” or “strip” and describes the cut of meat itself.The original fajitas were created out of necessity, not a desire to have something new… “The originators of what we call fajita tacos were the Hispanic ranch hands of West Texas who were given the head, intestines and other unwanted beef cuts such as the diaphragm as part of their pay. They pounded the diaphragm, marinated it with lime juice, grilled it, then cut it up and ate the meat with salsa and condiments on flour tortillas, which became common in Texas in the 1930’s”. 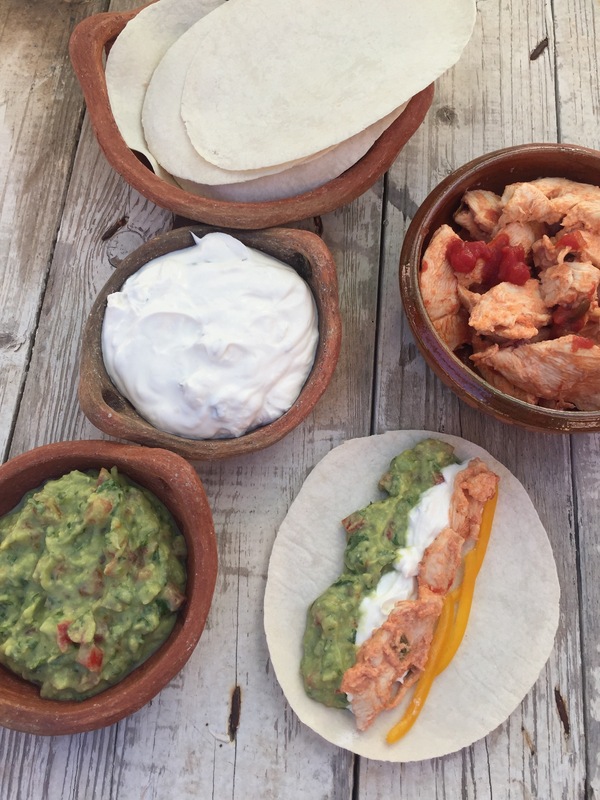 You can easily prepare and enjoy eating Healthylicious Chicken fajita wraps done from scratch in 4 easy steps! 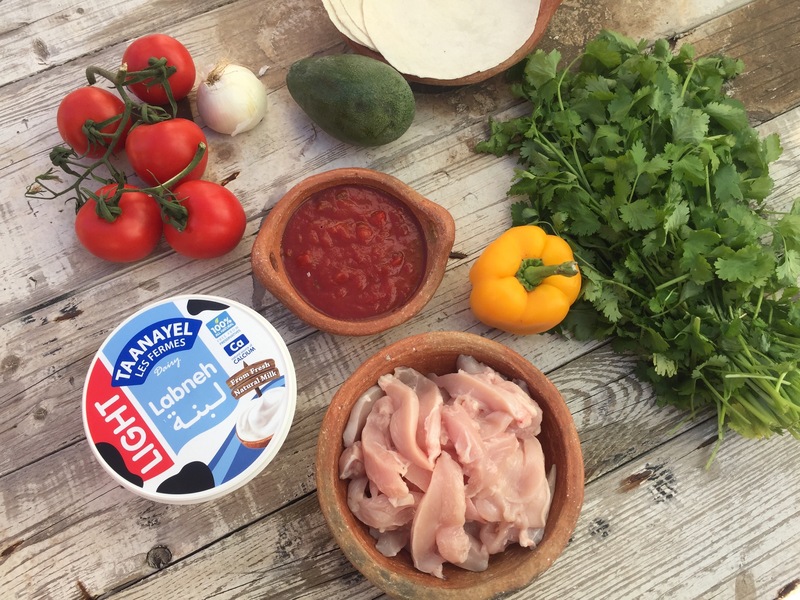 You need to slice chicken breast (1 kg) into strips then mix those strips with 6 tablespoons of @taanayellesfermes Labneh light and 6 tablespoons of a homemade Mexican salsa sauce (made from diced fresh tomatoes cooked with diced green peppers, diced red peppers, diced onions, tomato paste and a hint of Tabasco).You can add mushrooms and slices of yellow peppers. Marinate for a couple of hours or overnight. Lay the chicken strips in a large cast iron frying pan and let the chicken cook. Once cooked, set aside and start preparing the ingredients of the next post! I realized that most of the restaurants and caterers in Lebanon use huge amounts of oil to marinate chicken and tenderize it! 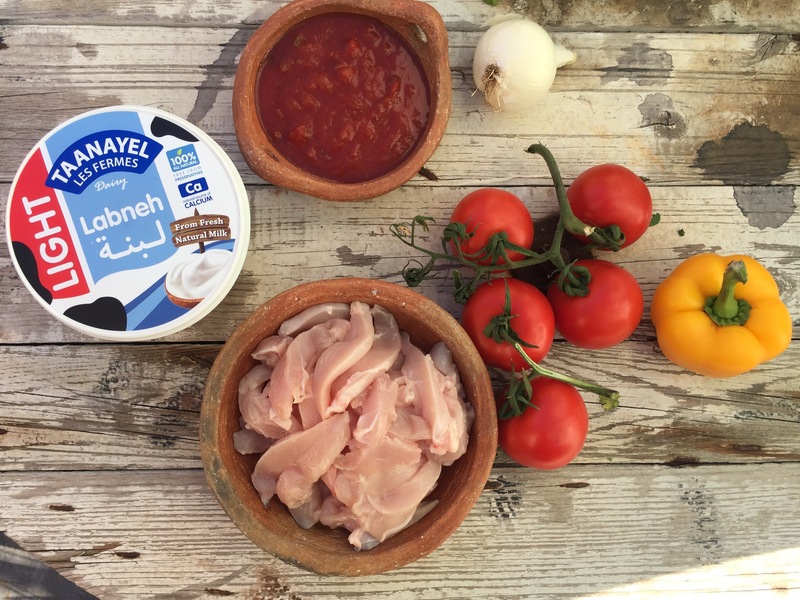 I personally just use Labneh that doesn’t only tenderize those chicken strips but also gives them a creamy texture with less calories and fat when compared to oil and more calcium! Learning to prepare a homemade Guacamole is not rocket science! And it is one of the healthiest condiments one could use to replace oily spreads and to benefit from the monounsaturated fats that avocados do contain and that help raise the good cholesterol levels (HDL). 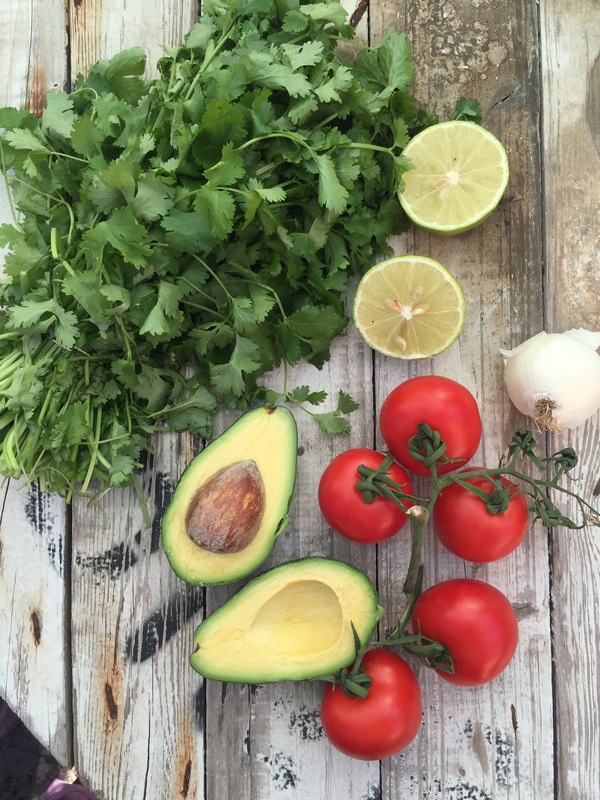 Peel and Smash 4 avocados • add the juice of 2 limes • add 1/2 teaspoon of salt • add 4 medium sized peeled and diced tomatoes • add half a small sized diced onion • add a handful of fresh chopped coriander leaves • Refrigerate • Serve! Each tablespoon of this homemade guacamole contains around 45 Calories! An Avocado contains around 20 essential nutrients of which vitamin C, B-Vitamins, Carotene, Vitamin E, Potassium, Magnesium, Zinc and others.. 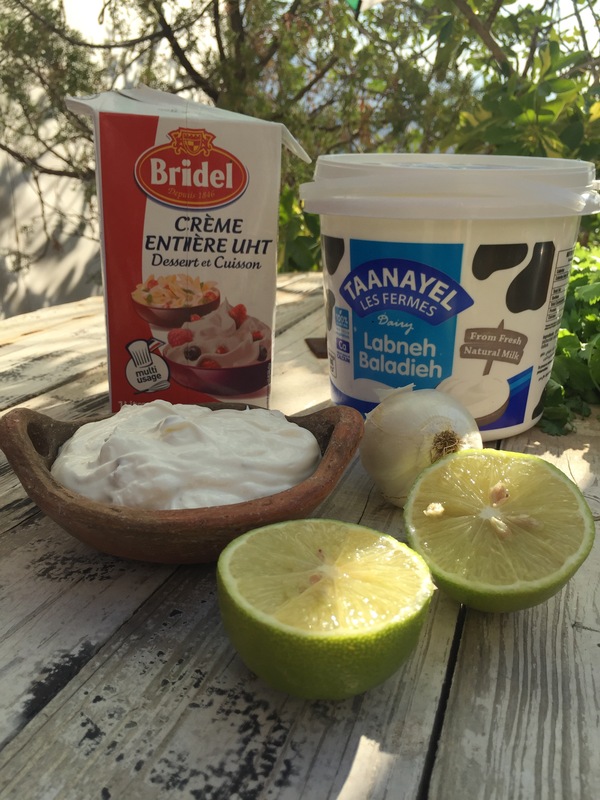 The easiest and healthiest way to prepare homemade sour cream is to replace most of the cream with Labneh and just use a small amount of whipped cream with lemon juice, onion juice and salt! All it takes is a bowl and a whisk or electric mixer to whip 200 ml of cream (Bridel) until soft peaks form. Add the whipped cream to 600g of Labneh and mix.Add the juice of 1 or 2 lemons (depending on your personal taste), 1/2 teaspoon of salt and 1 small sized grated onion. (You could use fresh ciboulette if available instead of using onions). Knowing that most sour creams found in restaurants are made from cream beware of their consumption in excess as they can easily add up unwanted calories! 1 Papa Sito 6inch-Tortilla wrap ( when you don’t have enough time to prepare a homemade one from scratch) topped with a teaspoon of guacamole, half a teaspoon of sour-cream; a tablespoon of chicken strips and thin slices of yellow peppers to add crispness and vitamin C to every bite! Remember to start with a salad and enjoy fajitas in moderation! ← ~*Salon du Chocolat- Beirut!